Free shipping. Buy direct from HP. 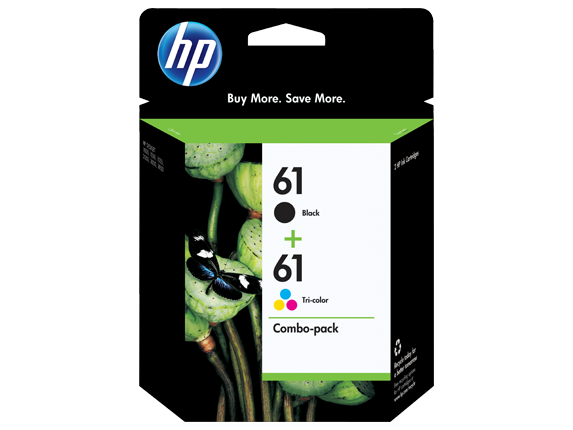 See customer reviews and comparisons for the HP 61 2-pack Black/Tri-color Original Ink Cartridges. Upgrades and savings on select products. Select the HP ink cartridge best for your needs. Do a lot of printing? Choose HP high-yield cartridges.It’s easy to monitor ink cartridge levels using the convenient on-screen gauge, so you never have to run out.Low ink alerts let you know if a new cartridge is needed so you can finish printing critical documents.Get up to 2.5 times more black printed pages and up to 2 times more color printed pages, using high-yield cartridges. 1 See http://www.hp.com/go/printpermanence and http://www.wilhelm.research.com. 2 Program features, retailer participation, and availability may vary by country. Internet access is required and not included. For more information, visit http://www.hp.com/learn/suresupply. Not compatible with Windows® 2000. 3 HP Planet Partners availability varies. For details, see http://www.hp.com/recycle. 80% of Original HP ink cartridges contain between 45-70% recycled content. For details see http://www.hp.com/go/rerecycled content. 4 Based on HP 61XL High Yield Black and Tri-color Original Ink Cartridges. High-yield ink cartridges not included; purchase separately. For more information, see http://www.hp.com/go/learnaboutsupplies. Less cost per page compared with manufacturer recommended street price and published page yield of standard-yield HP 61 Original Ink Cartridges. Actual pricing may vary. 5 Compared with individual HP ink cartridges. Based on estimated U.S. street price. Actual retail pricing may vary. 6 Compared with individual HP ink cartridges. Based on estimated U.S. street price. Actual retail pricing may vary.